The CEA (Commissariat à l'Energie Atomique) in France has selected a Cedip Infrared Systems' Silver 480M IR camera system to study the thermal processes in gas-cooled nuclear reactors. The shortlist for the 5,000-Euro Vision Award has been announced. 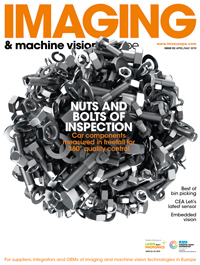 The award, sponsored by Imaging and Machine Vision Europe, will be presented at the Vision Show in Stuttgart. Through Prime Event Solutions, UK companies are being given the opportunity to appear in a special Showcase Lounge at the Vision Show in Stuttgart. Dana Whalls has been appointed managing director of the Automated Imaging Association; SensL has opened a new office in the US; and Goodrich is to enter a second phase of work with Darpa. A Korean manufacturer of construction equipment is using optical character recognition to ensure quality control of its heavy industrial machinery. Mercury Computer Systems has formed a new, wholly owned subsidiary - Visage Imaging - to concentrate on the life sciences and medical businesses. Leutron Vision's move from solely providing frame grabbers to offering camera systems too has proved successful, with a predicted double-digit growth in profit over the next three years. Three awards have recently been presented in the machine vision industry, recognising companies' ability at creating, integrating, and distributing high-end products. A new company, Invisible Vision, has been founded to provide discrete vision solutions for the scientific, medical, and industrial research communities. NET is to expand its primary administration, manufacturing and warehouse facility to approximately double its current size.